How do you pronounce Renault - Ray-Know or Reh-Nalt? No matter how you say it, today’s Nice Price or Crack Pipe GTA spells fun as it’s described as a turn-key SCCA F-SP racer. Will its price however, spell value? Last Friday’s hot rod 1978 Ford Granada inspired several extemporaneous and hilarious verses based on Allan Sherman’s knee-slapper, Camp Granada, and that really made my day. It also engendered a massive 81% (rounding down) Nice Price win for what was essentially a crazy almost-movie prop of a car with a pittance of a price. That Granada was pretty limited in the scope of its capabilities - those being frightening small children and concerning parents of teenage daughters - but it sure had its supporters. Despite Alton Brown’s derision of unitaskers however, I think one trick ponies still have a place in the world - especially if they offer that trick at a reasonable price. Today is Labor Day here in the U.S., a day when we’re called on to celebrate those who toil for the right to put bread on the table, a chicken in every pot, and two cars in every garage. Yay proletariat! Since the nation’s workers are supposed to get the day off - or at least get time and a half (yeah, right) - it’s only fitting that we look at at car that would give you something to do when you’re not working in that metaphorical coal mine. Maybe, you might want to go to the races? Speaking of which, have you noticed how Stef has been hitting it out of the park every weekend with the racing coverage? I know, it’s been tres awesome! In fact, it makes you kind of want to get out there yourself and test the edges of your own talent. Of course to do that, you’d need is a race car, right? 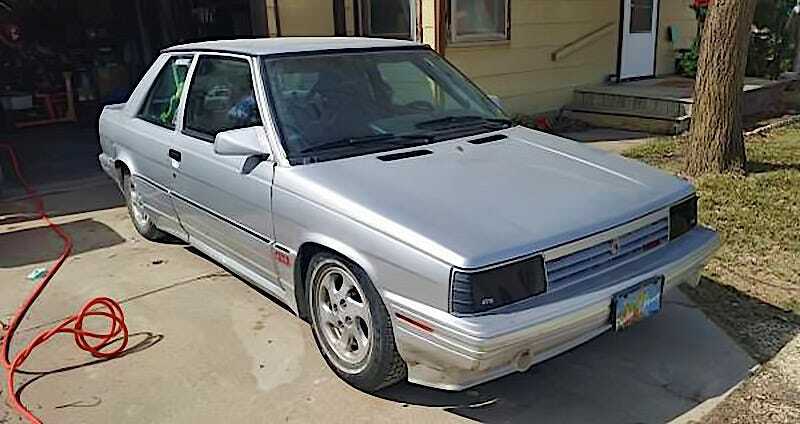 This 1987 Renault GTA is claimed to be prepped for SCCA’s F-SP (F Street Prepared) class and is ready to race. In fact, the ad shows a picture of the car turning a tire in anger amongst many, many orange cones, as it do. SCCA’s F-SP class is for street cars that aren’t really street any more, although they still need to be squint-worthy shooting distance from their road-car days. The rules require that the engine mods be minimal and the changes to this one have been limited to a custom intake, Megasquirt II FI and updated LS coils. And yes, it’s a stick shift in case you were wondering. The car rides on an adjustable coil-over suspension that with the racing wheels (Panasport knockoffs) rides too low to tow, so it also comes with some street steelies for getting the car to the track and back. Two sets of tires are included, and the seller says that the second will make it though another season. Inside, there’s a pair of Kirkey aluminum racing seats and the requisite SCCA-approved 6-point cage. That has apparently required the hacking up of the dash, but that’s okay because the purchase price includes another dash! In fact, when buying this car you’re also getting what’s described as 8 large tubs of additional parts, plus a bunch of stuff - engines, transmissions, body parts (hopefully Renault and not some neighbor’s) that won’t fit in the tubs. The dude says school has interfered with his racing hobby, but it’s obvious he also wants to be able to use his garage again too. That’s a lot of stuff so you better have a garage not so presently occupied. This car appeared on Bring a Checkbook Trailer a couple of months ago, which obviously did nothing to help the seller move his racer. Then it was three-grand, and since then he has dropped the price to $2,500, which borders on just come and take it money. What’s your take on this Renault (it’s pronounced no-longer-sold-here, by the way) GTA and that $2,500 price tag? Does that seem like a deal to turn key and turn track? Or, is this an SCCA racer with a price that erases any interest? Wichita Craigslist, or go here if the ad disappears.